The mesenchymal tumors discussed in this chapter represent a diverse group with distinctive morphologic, immunophenotypic, and molecular genetic features. Many of these tumors arise in the dermis or subcutis and can closely mimic cases routinely encountered in dermatopathology practice such as melanoma, carcinoma, dermatofibroma (fibrous histiocytoma), nerve sheath tumors, or granulomatous inflammation. 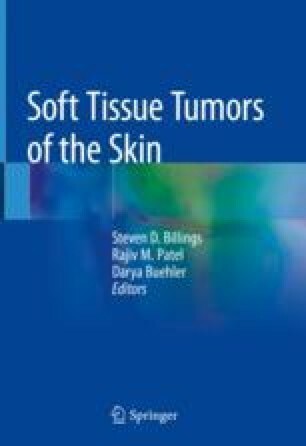 Others occupy deep and visceral locations and cause diagnostic difficulties when encountered in an unusual site, such as the dermis or subcutis. Reviewed herein are epithelioid sarcoma (ES), clear cell sarcoma (CCS), perivascular epithelioid cell tumor (PEComa), ossifying fibromyxoid tumor (OFMT), pleomorphic hyalinizing angiectatic tumor (PHAT), hemosiderotic fibrolipomatous tumor (HFLT), Rosai-Dorfman disease (RDD), solitary fibrous tumor (SFT), synovial sarcoma (SS), alveolar soft part sarcoma (ASPS), and cutaneous myoepithelial tumors. The discussion emphasizes the clinicopathologic features, differential diagnosis, and important diagnostic pitfalls encountered with these neoplasms, as well as diagnostically useful immunohistochemical and molecular genetic findings.